I arrived at the Hynes at about 8:45 and I had already made my first mistake - parking in the Prudential Center. I ended up paying $36 for parking - painful. At the last sale I had parked on the street and gotten a ticket, not good either. The bottom line on parking is - if you are sure you'll be there less than 5 hours, you can park in the Pru & get your ticket validated - you'll get a decent rate. But stay more than 5 hours and you'll pay the regular rates. Think you'll be there 4 hours at most? You might be surprised. I spent an hour and twenty minutes in line to get in and a whopping 2 hours and 20 minutes in line to pay! But I can honestly say, it was totally worth it. The wait to get in was actually pleasant. Most people there are very happy and excited to shop. I brought a book and got some reading done too. Everyone sat while we waited. There were at least several hundred people in line by 10, and they let us in in groups of 50. 3 groups were let in ahead of me - meaning that by 8:45 there were already over 150 people in line. People showed up to wait as early as 5:30 am. 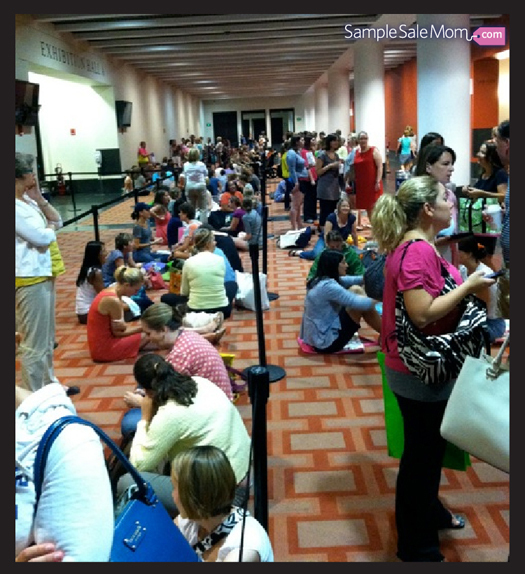 If you do show up that early, DO NOT wait outside the Hynes on the street! The people inside the Hynes (who got in through the hotel) apparently were let in first. 8:45 seemed to be the perfect time to arrive. I was let into the sale within 5 to 7 minutes of the start. I was told by workers that at the last sale (February 2012) there was one truckload of merchandise - at this sale there were two. Twice as much great stuff!! 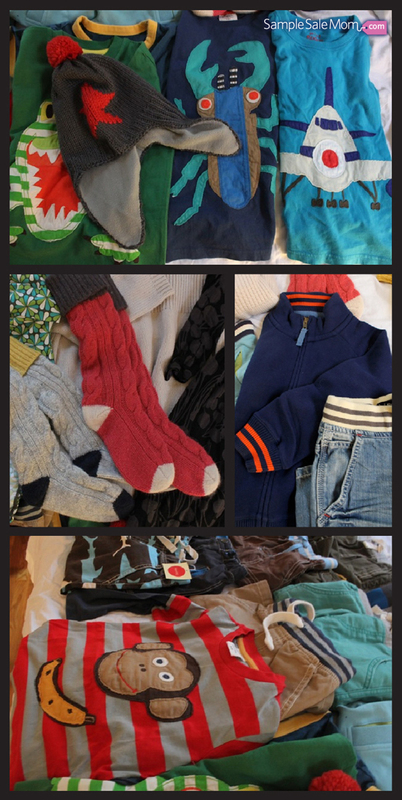 My main priority was buying a lot of great clothing for my two boys. I was looking for sizes 4 to 8. My second priority was to get a couple of nice fall things for myself and I accomplished both my goals. At the kids' tables it was mayhem. Women grabbing lots of clothing and stuffing into bags. I filled my bag and then headed to the women's area. After an hour or so of shopping I sat down to examine my haul. By that point there were huge "discard piles" accumulating on the floor. Everyone was going through their things deciding what they did or did not want. I went through my items and added several to the discard pile. Then I walked around looking for women sorting through boys' items. I went through their discard piles - I ended up getting about half my purchases from the discards rather than from the sales tables. There were thousands upon thousands of items so the whole thing felt like an enormous treasure hunt. Get my tips for shopping at upcoming Boden sample sales, plus find out when/where they'll happen here! 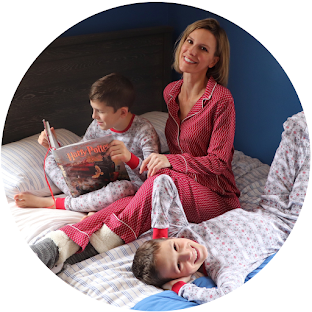 Last but not least, if you want MORE discounted Boden and Mini Boden and you don't feel like leaving your house, here are a few ways to save money on Boden right at home. 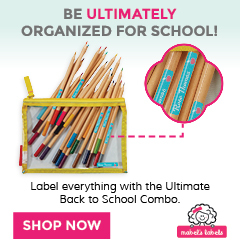 To get regular updates on Boden coupon codes (I never personally order without at least a 20% off code) - join Sample Sale Mom Deals on Facebook, as I regularly post the current coupon codes. 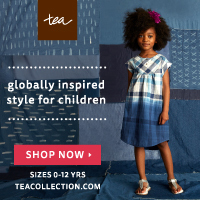 Online discounter Zulily sometimes has Boden sales at up to 50% off catalog prices. You can also search in their search bar any time and they often have a few Boden items on sale. To be alerted about upcoming Boden sales on Zulily,you can click the white heart next to "Boden" on the site so that it turns red. They also have sales on plenty of other awesome brands - some of my favorites include Hanna Andersson, Tea Collection, Kate Quinn Organics, Keen & Sophie Catalou. If you love Mini Boden, check out Hatley, which is high-quality, (read the reviews) to-die-for cute, and can be much less expensive. Post contains affiliate links. If you buy through one of my links, Sample Sale Mom will receive a small percentage of commission. Thanks for supporting Sample Sale Mom! I was bummed that I couldn't even get near the kids table! What was your stategy? Just getting there very early helped, so that's the number one thing. But it is tough - you don't want to be pushy & rude but you have to get up to the table! You can stand for a little bit, figure out where the size you want is, and then wait for someone to leave and slide into her spot. Even though it was very crowded and everyone was vying for position, I found that every woman I spoke to was super-friendly. So don't worry TOO much that "oh I bumped into her - she's going to hate me." She's not, just go for it. As long as you're not actually pushing anyone you're fine. Reading your blog and prepping for the big sale in 2 weeks!! One question, though- is the clothing new clothing or last seasons? What season/type of clothing should I be expecting for this upcoming February sample sale? I believe the clothing is all from catalog returns, so there is a HUGE variety of stuff, both pretty recent and past seasons. Summer clothing, winter clothing, outerwear, shoes, swimsuits, sweaters, plus sizes... As far as Mini Boden goes, the first things to go are the small sizes - those fly!! I didn't pay any attention to the girls' clothes since I have boys, but I noticed that boys items sizes 10+ were still available a couple of hours into the sale - everything else on the boys tables was gone. This seems like an awesome sale! Do you know if a Mini Boden sample sale ever happens in NJ? Just checked your website and see there is a sale in Oaks, PA which is close to where I live in NJ. Thanks! any word on any online sales? are there ever any online sample sales? Hi Kristen, YES!! Discount site Zulily (link: http://www.zulily.com/invite/1flashsalemom )will now be having Mini Boden on sample sale. I don't know when the next one will be but I will post it on my site and facebook page. Unlike the live sales, the online stuff is brand new this season. Only 40% or so off, not 80% like the live events. You MUST shop the Zulily sales at the very start of the sale because everything sells out fast. I bought a bunch of cute stuff from the January online sale and love it!